CI/CD drives continuous testing into production - What are the emerging trends in software development? In 2018, continuous integration/continuous delivery will finally become standard, in large part because companies have no choice. 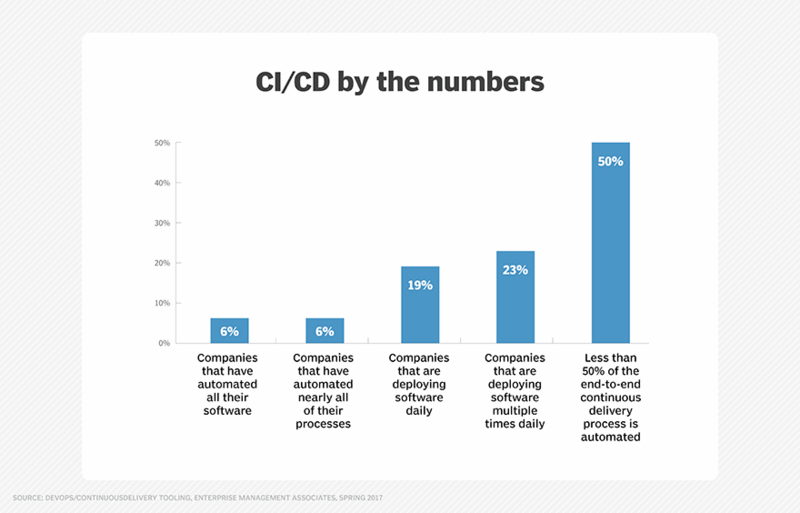 Just 6% of companies have 90% to 100% of the CI/CD pipeline automated, data from a 2017 Enterprise Management Associates survey indicated, yet pressure from management and customers for faster delivery of higher quality software is mounting. The answer is continuous testing, because, without that, none of the rest works. "While testing was once considered a barrier that jammed up the DevOps pipeline, more and more organizations must invest in continuous testing to assure continuous quality throughout the entire software development lifecycle," said Eran Kinsbruner, global technical evangelist at Perfecto. Tune in, DevOps adopters. "Continuous testing will allow developers to guarantee that their applications are working to the best of their abilities, despite these frequent changes, and with the help of groundbreaking, advanced technical enablers, like open source frameworks, machine learning/AI and the cloud, they'll be able to quickly tackle bugs, course-correcting in real time to deliver at a much faster pace," Kinsbruner said. Microservices have a role to play in the move to continuous testing as well. "To work best in DevOps, applications need to split into components that can be built and tested independently from each other," explained Hans Buwalda, CTO at LogiGear. "In particular, architectures with microservices running in containers are gaining ground. Testing at the level of single components tends to be fairly straightforward and not hard to fit into the pipeline." When continuous testing becomes mainstream, expect some fundamental shifts in how companies think about the differences between development and deployment. "Software will be in production earlier, but only for a small fraction or a special subset of traffic," said Ben Sigelman, co-founder and CEO of LightStep. "This transition means that the 'dev' or 'staging' environment is being phased out; production is the only game in town." What factors have helped your enterprise improve continuous testing?